The Red Devils boss is not exactly Mr Popular at Old Trafford right now, with four games in the Premier League now without a win. 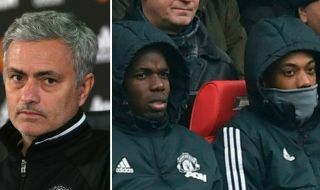 There has also been plenty of controversy behind the scenes, with Mourinho reported by the Mirror and others to have labelled midfielder Paul Pogba a ‘virus’ after the draw with Southampton at the weekend. The Portuguese then proceeded to leave Pogba on the bench against Arsenal, which didn’t end too well as the team dropped two points once again in another unconvincing display. The France international might not be in the form of his life, but it’s hard to imagine he wouldn’t have had something to offer against the Gunners. José is trying to convince us that our squad isn’t good enough. The same squad that finished 2nd last season. He’s the virus and he needs to get out asap. conclusion. There is no way United players train attacking drills/combinations during the week. Mourinho is the virus. Pogba's confidence has been utterly destroyed by Mourinho. Just hope the real virus, Jose gets the sack before it's too late. And for some reason, they don't want to let go of the virus that is plaguing our club. And no, I'm not talking about Pogba.